New York, N.Y. July 9th, 2018 – In recent months, artificial intelligence (AI) has been one of the most popular topics of discussion in tech news media. The exciting headlines and online chatter about AI, deep learning and neural networks continues to grow as more companies invest in the technology and more AI solutions are deployed in virtually every industry. 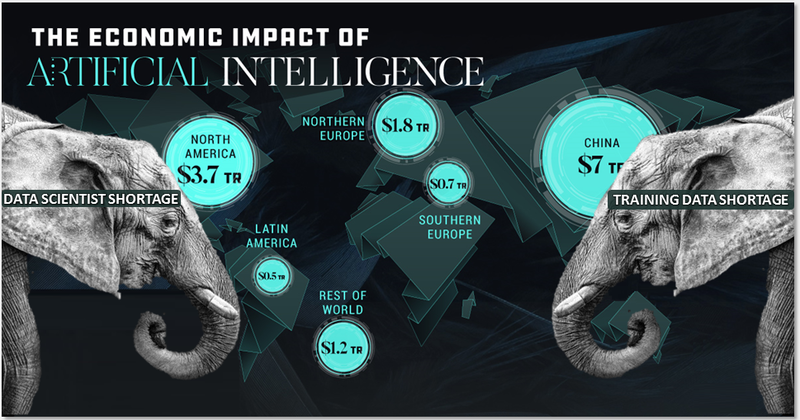 AI is expected to grow more than 25-fold in the next 12 years, adding $15.7 trillion to the global economy by 2030. But one AI expert offers a sobering reminder that there are now two big (and growing) elephants in the room – topics that aren’t discussed much – at least publicly – by AI entrepreneurs because they pose huge threats to the optimistic projections about the industry’s future. One is the stark shortage of data scientists. A report by Chinese tech giant Tencent revealed that there are just 300,000 AI developers and other AI professionals worldwide. But it's predicted that millions of jobs must be filled in the next few years if AI startups want to keep pace with the growing demand for AI solutions. The second threat is the equally stark shortage of properly organized datasets. A huge amount of task-specific data is needed to train AI algorithms and neural networks, the virtual brain of smart robots and self-learning, software programs. Organizing and labeling these datasets is a lengthy process that typically requires prohibitive amounts of expensive human labor. With AI talent and AI training data in short supply, Yashar Behzadi, CEO of Neuromation, says the solution to both problems is the development of more online AI development communities like the one he and his team have built at Neuromation. The company’s platform is the AI equivalent of a housing co-op; an ecosystem for the AI developers that promotes esprit de corps among its members who pool their talents. The Neuromation platform allows companies to find AI developers and allows developers to find clients and technical experts they can partner with to develop and train algorithms. In fact, the Neuromation “one-stop-shop” platform will eventually allow non-data scientists to create fairly sophisticated algorithms that were once the exclusive domain of trained AI software engineers. Behzadi estimates that the shared AI development tools and datasets will eliminate the need for many small to mid-size companies to hire their own full-time data scientists and reduce the overall man hours companies need to train AI algorithms by as much as 80% compared with the amount of time they would need to train AI algorithms on their own. The shortage of AI training data is just as challenging as the shortage of data scientists. It’s a fact - most AI developers who create and train AI algorithms consider training data to be more important than the algorithms themselves. In a report from Crowdflower’s Data Scientist, when asked to identify the biggest bottleneck to successfully completing AI projects, over half the respondents cited getting good quality training data or improving the training dataset. Large volumes of data are needed to train neural networks to do the most rudimentary things and training networks to perform more complicated tasks is even more difficult. It’s not just the mechanics of creating neural networks that’s challenging, but data scientists must also organize and label training data so that each algorithm will be properly trained on its assigned tasks. Unfortunately, for many enterprises, even companies with enough data scientists on staff, this makes machine learning time-consuming and impractical. Just as a community cooperative (co-op) in housing or banking is created to help members pool their resources to achieve a common goal they could not achieve by themselves, AI developers, entrepreneurs, and companies of all sizes will overcome huge bottlenecks in AI by pooling their resources. As the shortage in data scientists and data grows, community platforms like Neuromation, where talent and training datasets are shared, may be the easiest way for the AI industry to manage its own incredible growth in the years ahead, making AI available and affordable for everyone. MEDIA INQUIRY: To learn more about Neuromation, please visit their Website at www.Neuromation.io. If you have questions about synthetic data, the Neuromation blockchain or would like to interview Neuromation CEO Yashar Behzadi, please send an email to gary@VmatrixPR.com or call (510) 677-2947.